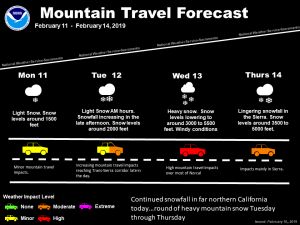 February 11, 2019 – Generally light precipitation over the northern mountains today into Tuesday with dry weather elsewhere. Widespread precipitation returns Tuesday night with the potential for significant mountain snow. 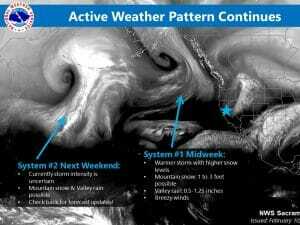 Active pattern may continue late this week into the weekend. Skies are mainly clear across the region early this morning except for lingering clouds over the mountains and across the northern Sacramento Valley. Current temperatures are colder compared to 24 hours ago and range from below zero to single digits in the mountain valleys, teens and 20s elsewhere in the mountains, and mainly 30s to lower 40s across the valley and foothills. Dry weather is expected across a good portion of the forecast area today as short-wave ridging quickly transits the area ahead of the next system. Generally lighter amounts of precipitation will be possible beginning this afternoon across the northern mountains and north end of the Sacramento Valley where cold air will continue to linger. 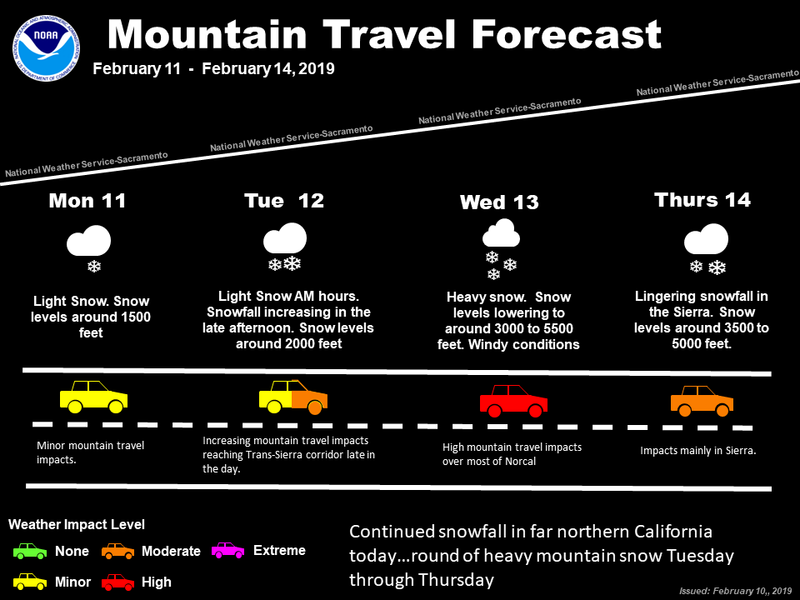 Increasing warm-advection and upslope flow will continue to squeeze out precipitation in that area tonight and Tuesday, and enough snowfall will be possible along I-5 north of Redding for some potential travel impacts. The bigger mid-week event is still taking shape for Tuesday night thru Thursday as the next cold low dropping down from the Gulf of Alaska draws deeper moisture from the Pacific northward into the region ahead of it. While exact storm strength and timing differences have some uncertainty, models suggest this system could bring significant precipitation along with strong winds across interior NorCal. Early QPF amounts suggest 1 to 2 inches in the Valley, and 2 to 4 inches, locally higher, over the foothills and mountains. 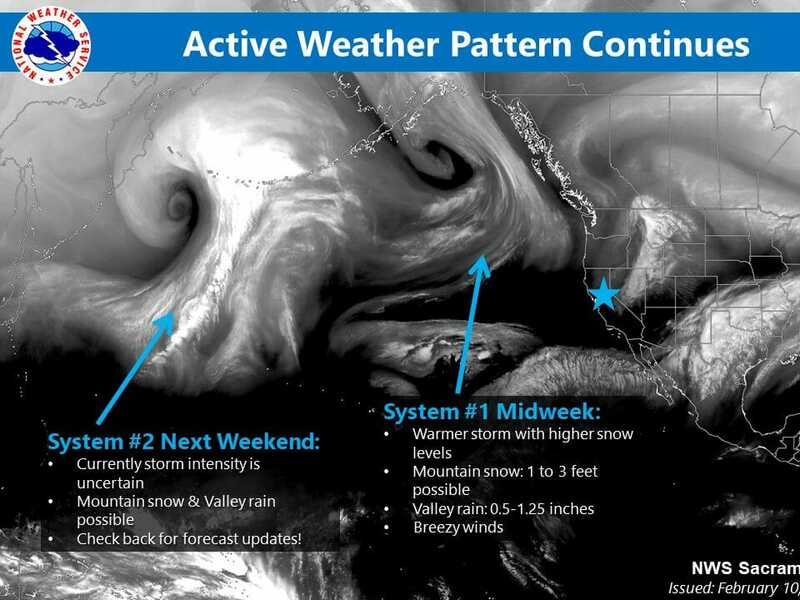 Models suggest this upcoming system will be warmer than this weekend`s system, but there is still some uncertainty regarding Pacific moisture interacting with it. Snow levels are anticipated to be around 1500 to 3000 feet on Tuesday, then could be rising to 40000 to 7000 by Wednesday afternoon, though cold air will likely remain trapped across the northern Sacramento Valley and northern mountains with snow levels remaining as low as 2000 feet in those areas. Snow accumulations could be around 2 to 4 feet, with localized amounts up to 5 feet from Tuesday night thru Thursday. Thus, significant mountain travel impacts could be possible from heavy snow and gusty winds. By Friday morning, a closed upper low will be located off the Pacific NW coast with unsettled weather expected across northern California. Light valley rain and mountain snow may continue Friday as a trough continues to amplify over the West Coast through the weekend. The ECMWF is more robust in precipitation amounts than the GFS as this trough digs into the southwest CONUS through early Monday. While specific amounts are still too premature to say, snow levels may lower down to roughly 3000 feet this weekend bringing more snow to mountain and foothill areas. Mid-level ridging may return Monday bringing a brief break to the persistent precipitation. Temperatures Friday and through the weekend stay relatively average with highs in the Valley in the mid-50s and in the 30s in mountain areas.